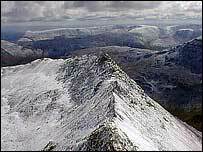 A man has died after falling 813ft (248m) from a ridge on Helvellyn. David Thomas Burke, 41, from Newcastle, was out walking on the mountain, which is one of the Lake District's highest. It is the second death on Helvellyn in less than a week. On Wednesday a 62-year-old man was killed when he was blown off a ridge and fell 1,000ft. The latest tragedy happened on Saturday afternoon at Striding Edge ridge, one of the most popular areas with walkers and climbers. The Patterdale Mountain Rescue Team attended the scene and Mr Burke was flown to hospital in an RAF helicopter, but was pronounced dead. Police said the coroner had been informed. Insp Barry Bell from Cumbria Police, who co-ordinated the rescue effort, warned walkers to be aware of the potential dangers of walking in the area. He praised the efforts of rescuers, but urged walkers to be "extremely aware" of weather conditions and their own abilities, while planning to venture onto the Lake District fells. He added: "You never get used to any instances like this. "I understand people enjoy walking, but when you have a devastating consequence when somebody loses their life doing something they enjoy you know it's particularly difficult for people who attend."